The official opening of AirVenture 2008! My top priorities for the day were to pick up my “free” SPOT Satellite Messenger and to see the unveiling of the Icon A5. We had breakfast at the motel and were at AeroShell Square by 8:30 AM. The Icon unveiling was scheduled for 10 o’clock, so I went to the SPOT tent first. SPOT had a special offer for EAA members attending AirVenture. By signing up for both the basic and tracking services, we got the SPOT Messenger unit for free. I had preregistered for the offer online so it only took a few minutes to pick up my Satellite Messenger. On the way back to the Icon Aircraft display, we stopped by the AOPA tent to get a close look at this years sweepstakes aircraft. It is a ’76 Piper Archer with extensive restoration and upgrade work done. The airplane looks great. I wouldn’t mind being the winner. We got to the Icon tent in time to be close to the front of the gathering crowd. I have been following the progress of Icon Aircraft and of the development of the A5 for some time so I was anxious to see the real thing. The Icon team unveiled both a mock up of the aircraft and the actual prototype that flew on July 9th. Of all the light sport aircraft that we saw at AirVenture, and there were a lot of them, this one appeals to me the most. It is a trailerable amphibian with folding wings. The Icon team is targeting not only current pilots but also people who hadn’t even thought about flying before seeing this airplane. Despite having a stick instead of a yoke, the interior is much more car like than most airplanes. I’ll take one of these too. I guess it would have to be a second airplane. We spent the rest of the morning and early afternoon visiting more of the outdoor exhibits. Cirrus and Cessna both had large display areas. The Cirrus jet was there along with the SR-22 GTS Perspective. I said before, that if I had an unlimited budget, the Perspective would be my choice for a traveling airplane. After visiting the Diamond display at Oshkosh though, I just might have to change my mind. The Diamond DA-50 might be my new favorite airplane in that class. The top of the line Superstar model looks like pure luxury. The same airframe will also be available with a diesel engine that promises a cruise fuel burn of just 6-7 gallons per hour. That model is designated as the DA-50 Magnum. By about 2PM, we had made our way to runway 18/36 and staked out our spot for the afternoon airshow. 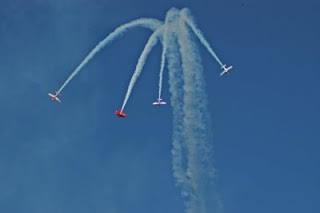 Oshkosh attracts the very best airshow performers and this year was no exception. The show started at 3:30 but, before that, was a display portion that included a formation of vintage Bonanzas and many restored warbirds. The show itself was kicked off by the Liberty Parachute Team and included: the Aerostars, Chuck Aaron in the Red Bull Helicopter, the Collaborators, Kyle Franklin, Mike Goulian, Kent Pietsch doing his remarkable deadstick aerobatic routine, Gene Soucy and Teresa Stokes with their wing walking act, Patty Wagstaff, Mike Wiskus, and the incredibly loud Harrier II (see my video here). Capping off the show was the arrival of the huge Boeing Dreamlifter. The weather was perfect and the show was fantastic. We finished the day with more exhibits and dinner at Friar Tuck’s.